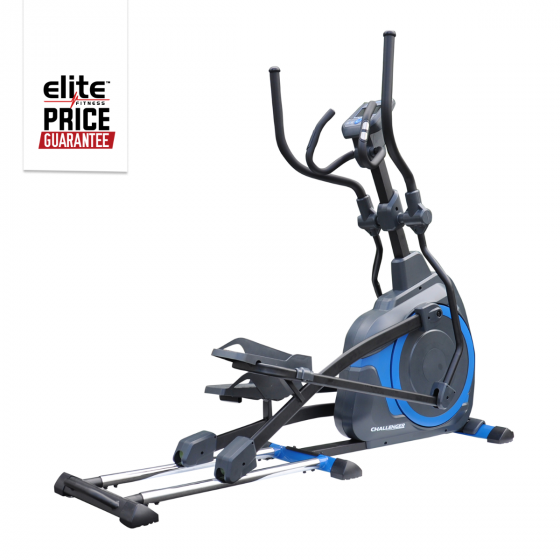 The Elite Challenger Elliptical Crosstrainer offers a comfortable and effective workout that will have you burning fat in style. This fantastic model makes use of a generous 19" stride length, 8kg balanced flywheel, and large pedals to deliver an incredibly smooth workout experience. This Crosstrainer is ideal for users wanting a full body workout at home, for a price that won't break the bank. Track your progress while working out with the LCD Console, updating workout statistics as you train such as Speed, Time, Distance, Calories and Watts. Be sure to keep your heart rate up by placing hands on the Heart Rate Grip Sensors, monitoring your pulse. The Challenger lives up to its name thanks to 16 levels of magnetic resistance and 12 built-in workout programmes. Push yourself to the limit, smash your fitness goals and enjoy the results! Programs: 12 Built-in Workout Programs. Flywheel: 8kg Heavy Precision Balanced Flywheel. Stride Length: 19" stride activates the most muscle within the elliptical motion.